What Happened to SouthWestern Ohio Wine? The Ohio Valley American Viticultural Area (AVA) follows the river along the bottom of Ohio and extends into Kentucky and Indiana. It’s the second largest AVA, but wineries are positioned sparsely throughout the viticultural area. In the decades before prohibition, this region was one of America’s largest producers of wine, but what are they doing now? I did a little research and placed a few calls to wineries in the greater-Cincinnati area. There are more than a dozen wineries in that corner of the state. A few were closed for the holidays and some were importing their fruit from the west coast. So I narrowed the field and settled on three wineries–all of which were cultivating their own grapes. While everyone else was engaged in ‘Black Friday” holiday shopping, I set off on my mini-tour of Southwestern Ohio wine country. I should pause here to point out that I grew up in Southwestern Ohio. I currently live in Virginia, where I write about the local wine industry for The Virginia Grape. A Thanksgiving trip back to the Buckeye State offered an opportunity to check out a few wineries. I must admit real curiosity about what is happening in that part of the country. I had previous experience with only one Ohio winery and that was probably thirty-five years ago. I went to a wine festival at Valley Vineyards near Morrow. I distinctly recall drinking wine, I vividly remember white wines with bracing acidity, but that’s all I can tell you. So basically, I was a blank slate. I knew the wineries existed, but little more. 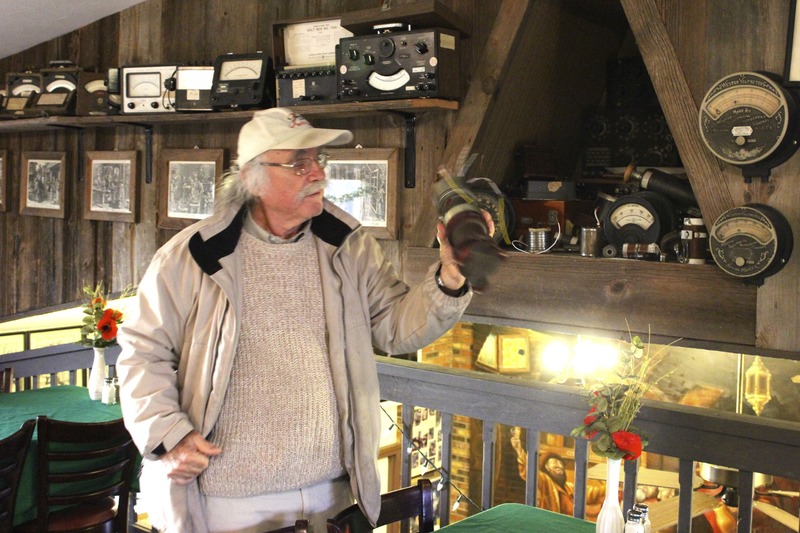 Midwest wine trips during the winter provide guests many opportunities to get involved with local wine production. 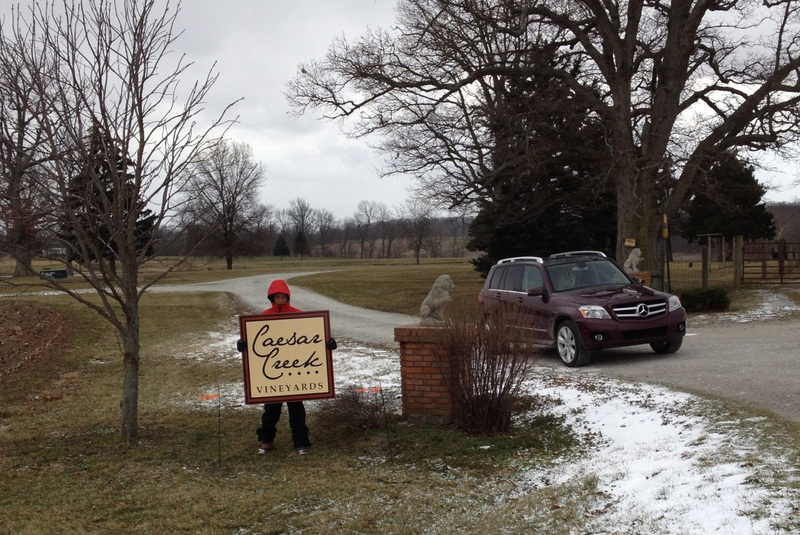 My first stop was at Caesar Creek Vineyard east of Dayton. This winery is about twenty miles north of the AVA and two USDA cold hardiness zones colder than my current home Charlottesville, Virginia. What varietals could possibly grow in such conditions? I braced myself as I parked outside the tasting room. I was fully prepared for the grape-jelly taste of Concord or Niagara wines. What I found instead was quite surprising and just the first in a day of exciting discoveries. Caesar Creek is relatively new. Walter Borda only began planting his vines in 2004. He chose hybrids like Noiret, Frontenac, Foch, Cayuga, Seyval Blanc, Chardonel and Traminette. All of the Chardonnel was lost to the Polar Vortex of 2013, but Walter is pressing on while deciding what to plant in its place. To make the wine, Walter hired Trisha Chalfant (photo below), a relative novice fresh out of graduate school at Ohio State. Despite this, she works wonders with the hybrid varietals. I was completely taken aback by the quality of the wines. The whites were well done, but the reds were spectacular. I never expected wines of such quality from Frontenac and Noiret. It completely changed my perception of American hybrids. 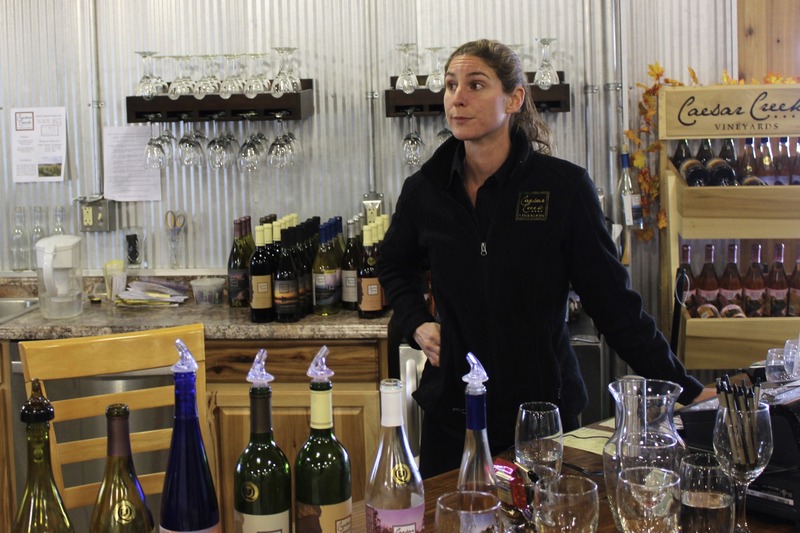 Still reeling from the surprises of my Caesar Creek visit, I traveled south into the AVA and made a stop at Valley Vineyards, which has been on the scene since 1970. That makes them older than any of the Virginia wineries I typically write about. Joe Schuchter met me in the tasting room and stepped me through the offerings. He represents a third generation of the Schuchter family, which is now taking the helm at Valley. Like his father and grandfather, he is engaged in the evolution of local wine production, while working hard to produce the best possible product. He pointed out that the winery is also making an effort to improve its image. They’ve discontinued the old wine festival, because it was an exercise in excess, where they sold a lot of Concord. They just don’t want to be known for that. What they are doing was another huge surprise. The moderating affects of the Ohio River make cultivation possible for certain vinifera and warmer-climate hybrids. I did a barrel tasting of an amazing Cabernet Franc. This is a varietal that is grown widely in Virginia, so I know it well. It had all the typical characteristics and can easily hold its own against Cab Franc from other parts of the country. Chardonnay, Syrah and Cabernet Sauvignon round out the list of international varietals grown on the estate. A number of French and American hybrids are also grown. Included among them are Seyval Blanc, Traminette and Vidal Blanc. The Vidal is used to produce a very well crafted and balanced ice-style wine. Once again, I was just blown away by the quality and impressed with the entire lineup. My final stop of the day was at Vinoklet, which is located just north of Cincinnati in the town of Colerain. This winery made Columbus Monthly’s list of Ohio’s top ten food and wine destinations and a Cincinnati Magazine reader’s poll chose it as the area’s ‘most romantic restaurant.” Perched on the ridgeline overlooking the Miami River Valley, it’s not hard to understand all the accolades, but what about the wine? Kreso Mikulic is the owner and winemaker. He was waiting in the restaurant when I arrived. I told him I’d been instructed to ask specifically about his Traminette, which was selected as the best Ohio wine in 2012. He poured me a healthy glass and poured one for himself, ‘to prove it wasn’t poison.” It was a fabulous white wine and demonstrated all the best characteristics of that grape. On top of that, the range of varietals and quality of the wine was similar to Valley Vineyards, which further confirm my observations on the regional offerings. I will admit that this was a small sampling and I will caution you to do your research prior to striking out on a Southwestern Ohio wine adventure. That being said, I do know for certain that there are others worth checking out. My choices were driven by the season and the fact that I was limited to a single day. While this region may no longer rank among the largest American wine producers, I will posit that quality has improved greatly since the pre-prohibition era. This is an area worthy of attention and one that has additional potential for wine production. Brian Yost writes and publishes “The Virginia Grape,” which started strictly as a blog about Virginia wine. Beginning in late 2014, Brian began to branch out and cover the wine industry in other underrepresented areas in the Eastern United States. Brian is a long-time resident of Charlottesville, Virginia, which is in the heart of Central Virginia wine country. In addition to his blog, he writes winery profiles for American Winery Guide. Come back this summer and check out Harmony Hill, Meranda Nixon and Kinkead Ridge, all making some of the really best wine in Ohio!